Here’s another reason I haven’t been baking much. I was never a big fan of low-fat ice cream until “slow churning” came along. The slow churn (or double churn, as Breyers calls it) gives low fat ice cream the ultra smooth texture you get from a full fat product. I’ve been eating the slow churned ice cream for a while and am glad they are now incorporating it into bar form. The Breyers bars are a good size – not too big, not too small. I think the most important thing is that eating one gives you the psychological satisfaction that you’d get from having eaten a full fat, totally loaded ice cream bar. Michelle, our grocery store has both brands of bars — Dreyers and Breyers. It took me about 10 minutes to choose between the two and I went with Breyers. I’ll pick up a box of the Dreyers this weekend and do a taste test. My daughter likes the American Idol “Take the Cake” too. My favorite American Idol flavor is “Triple Chocolate Talent” or at least that’s what I think it’s called. I hope they keep making it. So funny to pull up your page and see that box! I JUST got one of those out of the freezer for my daughter! 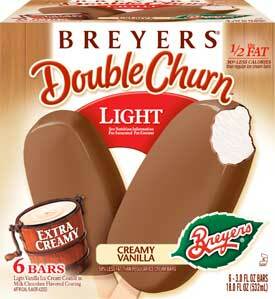 I like those, but I think I like the Dreyer’s Slow Churned the best! I like that they’re lower in fat, but my kids don’t know it!!!! My daughter is also a fan of the Slow Churned American Idol Flavor “Take the Cake”!